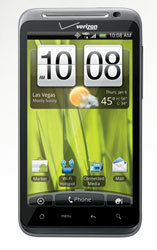 HTC announced two new 4G Android 2.2 phones at CES—the HTC ThunderBolt for Verizon and the HTC Inspire for AT&T. Both are essentially clones of the HTC EVO on Sprint, and break new ground mostly in the fact that they will run on the new "4G" networks from each carrier. Of the two, only the HTC ThunderBolt is true 4G. 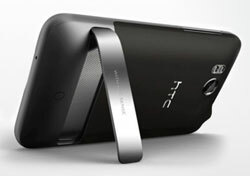 The HTC Inspire will run on AT&T's HSPA+ network, which technically is a faster version of 3G. Beyond the faster networks, the remaining specs are very similar to the Sprint EVO. The Thunderbolt and Inspire are both targeted at video consumers, with giant 4.3-inch displays and a handy kickstand on the back to prop up the phone while viewing. Hidden behind the kickstand is a secondary speaker for enhanced sound. Each also has an 8MP camera along with a 1.3MP front facing camera for video chat and a 1 GHz processor. While the ThunderBolt comes with 8GB on internal RAM and a 32GB SD Card, the Inspire on comes with 4GB preinstalled. The Inspire also has a smaller battery than the Thunderbolt (1230 vs 1400 mAh). Of the two, the ThunderBolt's faster network, greater RAM and bigger battery definitely make it the more...inspiring. Pricing and availability have not yet been released. But I will throw out a guess of $199.99, based on how much every other new high-end smartphone has sold for at launch.